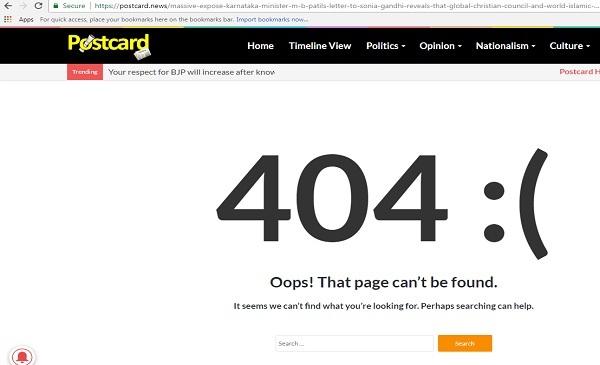 Fake news website Postcard is in overdrive as Karnataka counts down to vote on May 12. 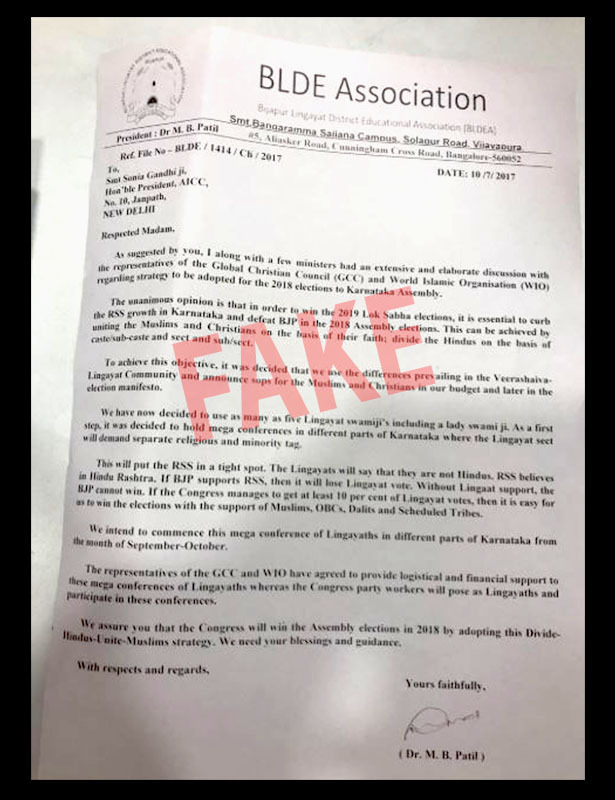 On Friday, the infamous website published a fake article alleging that Karnataka Water Resources Minister MB Patil and Sonia Gandhi, former president of the Indian National Congress had “masterminded division of Lingayats in Karnataka” to gain votes. The letter dated July 10, 2017 is allegedly addressed to Sonia Gandhi and is purported to be written by Patil on the letter head of the Bijapur Lingayat District Educational Association (BLDEA) of which Patil is the president. The fake letter has Patil informing Gandhi about a meeting he and a few ministers held with representatives of the Global Christian Council and World Islamic Organisation regarding “strategy to be adopted” for the Karnataka assembly elections. The story was uploaded by Postcard on Thursday night but taken down by Friday afternoon. Take a look at the archived version of the article which went viral on Twitter, Facebook and WhatsApp. A Google search for “Global Christian Council” and one for “World Islamic Organisation” did not yield any results. The story accompanying the letter has photos added from the massive rally held by members of the Lingayat community in Kalaburagi on September 25 which was attended by seers of over 20 lingayat Mutts and Congress leaders like Patil. It also includes photos of Mate Mahadevi who was one of the first seers to publicly support Patil and Siddaramaiah. The photos are an attempt by Postcard to lend credibility to the contents of the fake letter. BOOM spoke to Patil who said that the letter and the contents of it were fake. “When I saw the story I was enraged. They have scanned a copy of the letter head of my organisation BLDEA and my signature. It is gross lie by the website and all to tarnish mine and Soniaji’s reputation,”he said. Patil also said that he is initiating legal action against Postcard and filing a criminal and a defamation case against them. 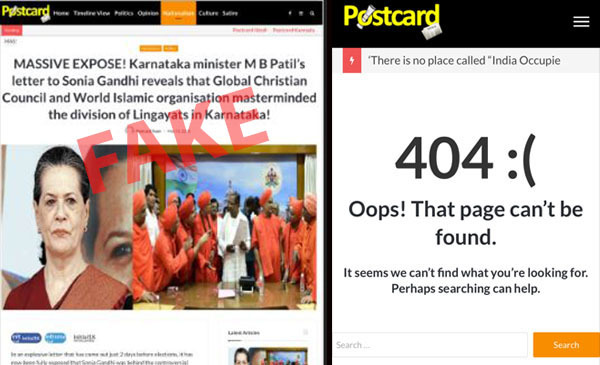 Postcard’s fake letter is the second fake letter involving Lingayats and the Christian community in India. 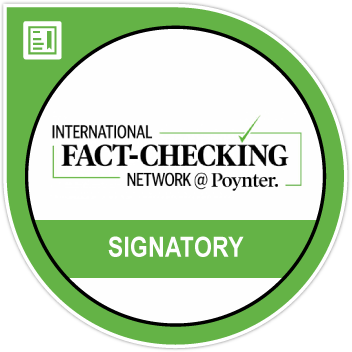 Earlier in the week, BOOM was the first fact-checking organisation to call out a fake letter supposedly from the Catholic Bishops’ Conference of India to Bangalore’s archbishop asking him to convert Lingayats in the state to Catholicism. Read the story here. 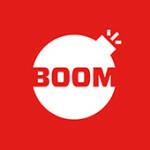 Postcard has been busted by BOOM several times in the past for spreading disinformation. The website’s founder Mahesh Hegde was arrested earlier this year by Bengaluru central crime branch for spreading fake and communally sensitive stories.